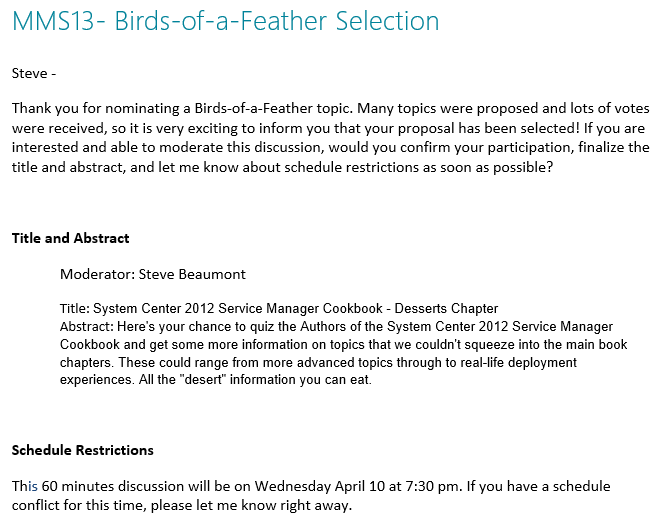 I've just had the e-mail I was hoping for - My BoF session nomination at the Microsoft Management Summit 2013 has been approved. 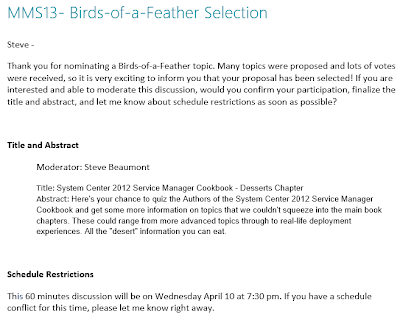 Here's your chance to quiz the Authors of the System Center 2012 Service Manager Cookbook and get some more information on topics that we couldn't squeeze into the main book chapters. 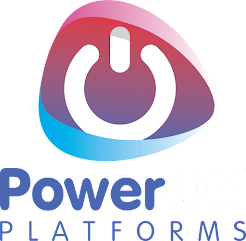 These could range from more advanced topics through to real-life deployment experiences. All the "dessert" information you can eat. Join Myself (Steve Beaumont), Sam Erskine (MCT), Anders Asp (MVP), Dieter Gasser and Andreas Baumgarten (MVP) and ask us all those pressing SCSM questions that the book may not have answered. There may even be a prize or two for the best questions!